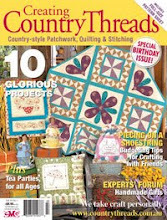 My latest stitchery project is out now in Country Threads magazine. and needs to have a big sleep during the daytime. I love the setting and props the stylists have used for this shot. Gum leaves and gum nuts - of course! lol! Sandi he is gorgeous. Bravo. 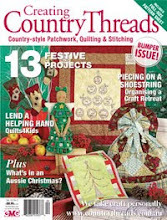 Congratulations on being on the cover Sandi...your koala is very cute! Another winner! I wish I could relax like that! Your Koala is so very cute. Well done. Well done you, he is just gorgeous! Hi from a windswept and very wet Yorkshire :0).